These companies are on the cutting edge and are transforming the way we do business. We extend our sincere congratulations to all the winners for achieving remarkable growth while delivering new services and experiences for their customers. 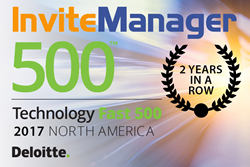 InviteManager announced today it was included for the second year in a row onto Deloitte’s Technology Fast 500™ list, a ranking of the 500 fastest growing technology, media, telecommunications, life sciences and energy tech companies in North America. InviteManager has had a standout year in which the company has launched a new, exclusive partnership with Ticketmaster, a new way for companies to send all their ticket requests to InviteManager for automatic fulfillment, and has opened two new offices in Chicago and Arizona. InviteManager was also recognized in 2017 by the LA Business Journal and San Fernando Valley Business Journal for being one of the fastest-growing businesses based in Los Angeles. The choice of thousands of globally known companies like Nissan, FedEx, Verizon, American Express, Anheuser Busch, MasterCard and 80 pro and college teams in the NFL, NBA, NHL, and NCAA, InviteManager connects companies and their customers with event and ticket management solutions for today’s business. InviteManager partners with the leading players in the events and corporate ticket industry, including Ticketmaster, Stubhub, Uber, and OpenTable. By working right inside the apps customers already use, like Salesforce, Concur, and Microsoft Outlook, InviteManager makes it easy for business of all sizes to manage all their client entertainment without having to switch between multiple apps.